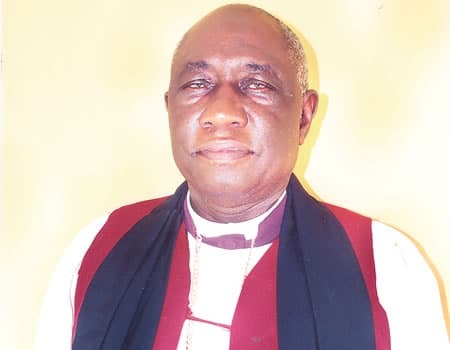 The Bishop of the Diocese of New Busa, Kwara State, the Most Rev Israel Amoo, has advised Christians to disabuse their minds of the thought of going to church to make money. He explained that it was wrong for Christians to think that they could make money by going to church, adding that going to church is rather a conscious and more rewarding move towards a person’s sincere search for God. Bishop Amoo stated this in the homily he said at the All Saints Cathedral Church, Onitsha, at the weekend during the concluding church service of the annual Fresh Manna Conference of the Diocese on the Niger. “Brethren “, he said, “you don’t go to church to make money. You instead go to church to seek God for the interest of your soul, “he had emphasised. In an exposition on the place of the cross in the life of Christians, he had in the sermon he tagged, “Take your cross daily and follow me”, explained that while the cross is the symbol of the Christian faith , it equally, has been a sign of rejection, humiliation and bad luck. He however, remarked that the death of Jesus on the cross and His Resurrection have inversely turned the cross into a symbol of victory and eternal life, the reason of which he enjoined Christians to take their cross daily and follow Christ. The Bishop also underscored that the need for Christians to carry their cross daily after Christ is not only for themselves alone but also for the nation, saying that Nigeria as a country now needs men and women of love who are ready to sacrifice self for God and humanity. Bishop Amoo therefore appealed to Christians to stop perceiving the church as a place to make money but instead a place to serve God and mankind for the good of their souls. The four -day spiritual carnival featured several seminar topics among which are, “Calling and ministerial fulfilment” by Ven Osondu, “Wealth creation…”by Dr Maxwell Umunna, “The Holy Spirit ,” by Evan Joshua Chukujekwu and “Politics and you, “by Sir Victor Ndu. Also cheques of various amounts were distributed to more than 20 students studying in many higher institutions in the country under the scholarship of the diocese.